A tree that produces blue flowers? Yes! 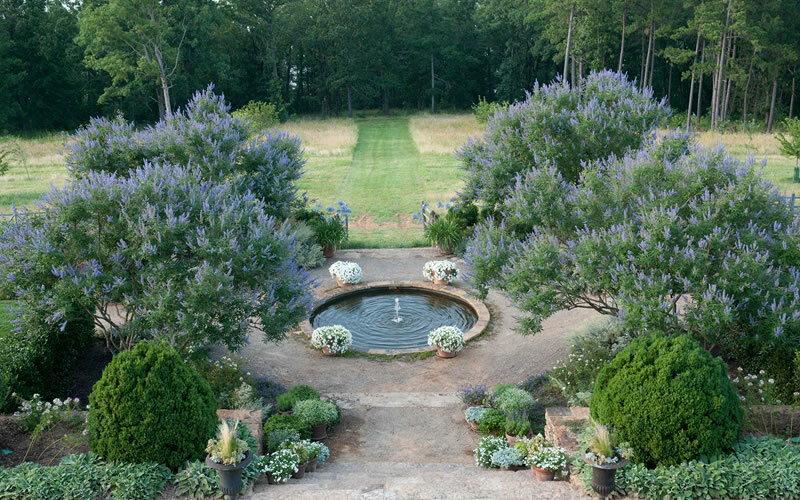 Some people call this the "Sage Tree" because the striking, pretty spikes of violet-blue flowers resemble that of blue sages (Salvia). Get all the details below! A tree that produces blue flowers? Yes! Some people call this the "Sage Tree" because the striking, pretty spikes of violet-blue flowers resemble that of blue sages (Salvia). 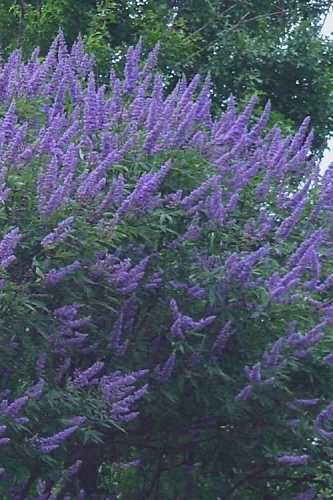 When young and in bloom, many also mistake this tree for butterfly bush. An abundance of flowers are produced during late spring to early summer. If there's average or adequate rainfall or irrigation during the summer you can expect another good flush of flowers in late summer or early fall. The 5-lobed leaves, which resemble those of Japanese maple or cannabis plant, is pleasantly aromatic. 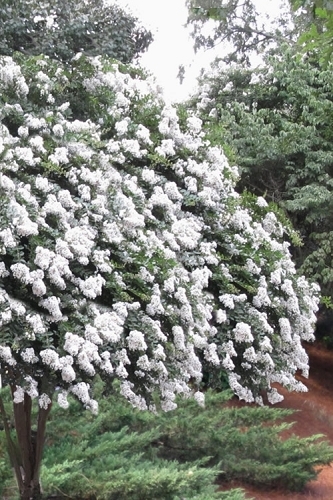 The flowers of the Chaste Tree are very attractive to butterflies, hummingbirds and beneficial pollinating bees. If the spent flowers are left on the tree in fall, seeds will form that Cardinals and other birds absolutely love to dine on during the winter months. So, if you are into feeding the birds, this is a must have tree that will provide a free source of food for them. Depending on your preference, Chaste Tree quickly grows into a multi- or single-trunk shrub or small tree to about 15 to 20 feet tall and 15-18 feet wide. In design, we use it as we do upright Japanese maple: as a focal point specimen tree, in groupings of three or more where space allows, or to frame in the corners of homes and other structures. Grown as a shrub, when planted in straight or staggered rows it makes a colorful hedge and looks especially nice around garden ponds and other bodies of water and in rock gardens. A worthy addition to bird, butterfly, pollination and blue theme gardens! Chaste Tree will grow in most any average soil, including clay soils. 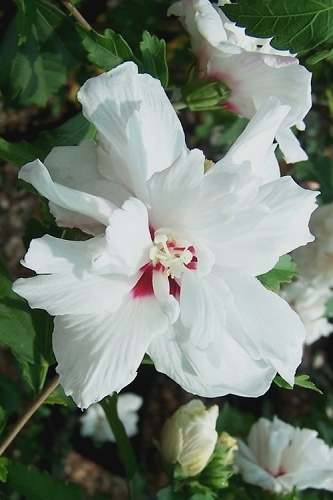 It prefers a moist but well-drained soil however will tolerate temporary wet conditions. 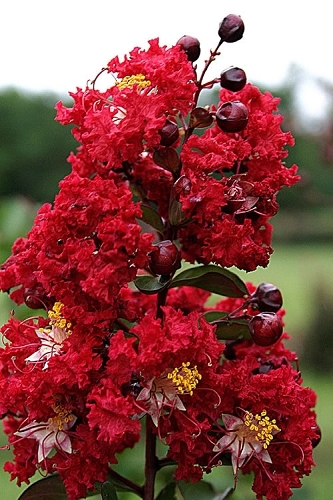 As with so many other ornamental shrubs and trees, constantly wet soil can be problematic. Good drought tolerance when established. Note: The chaste tree is cold hardy in USDA Zones 5a-9b. In USDA Zones 5 and 6 young plants might die back to the ground during an unusually cold winter. 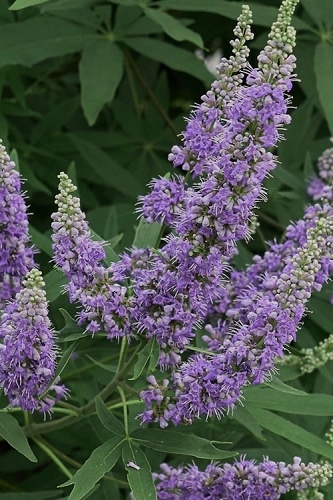 If so, cut the plant back to the ground like you would a butterfly bush and it will quickly regrow to a 4 to 6' shrub. 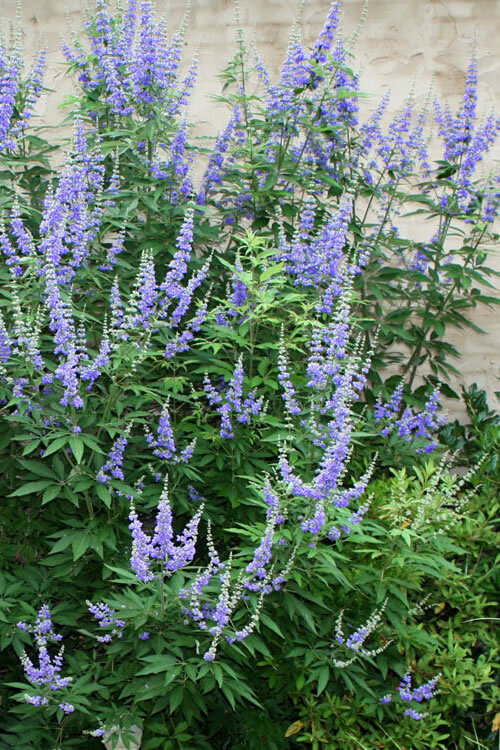 Click on a link below to find helpful advice from our experts on how to plant and care for Vitex Chaste Trees. The Chaste Tree Is Growing! This tree arrived in perfect condition and right on time. Very healthy looking- cannot wait to see the "blue" flowers! Arrived quickly, very well packed. Now (3 weeks later) growing nicely and is healthy. I couldn't be happier with the condition of my new plant and was very pleased with how quickly my order was shipped. Thanks! 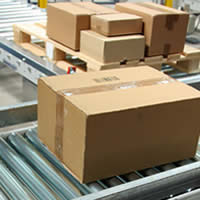 Packaged very well! We were surprised that it had leafed out already. Thanks! 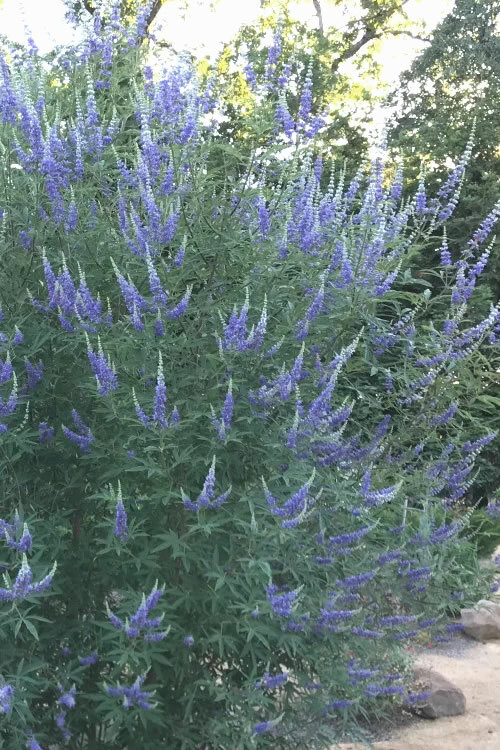 Q: Regarding Blue Chaste Tree - Vitex agnus-castus, is this tree deer-resistant? thank you! Yes as described in the plant details information, Blue Chaste Tree is considered deer resistant. 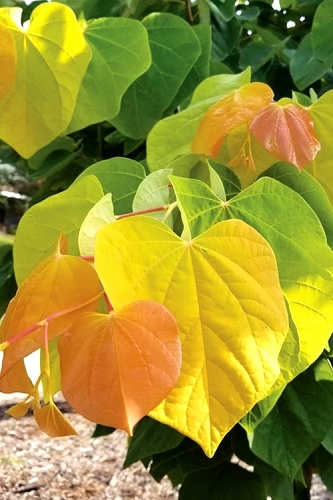 Follow the links below for more information on the Blue Chaste Tree and other great deer resistant plants! I hope these articles will be helpful. We are here to serve. Q: Chaste Trees: Please give me your opinions as to suitability in Orlando, FL, zone 9b? Would you avoid planting in full sun given the very strong FL sun and heat? I find that many plants that specify full sun can't deal with FL full midsummer sun. Thoughts? I spend a lot of time in Florida and was in South Venice (Zone 9b/10a) recently and saw a very nice chaste tree growing there. If I remember right it was growing in full sun, which is what this tree prefers. That said, a little filtered sun during the mid afternoon hours probably wouldn't hurt. My father lives in The Villages, just south of Ocala, and I've seen established chaste trees growing there as well. So I think you should be fine there in Orlando. Let us know if you need more details or have any other questions. 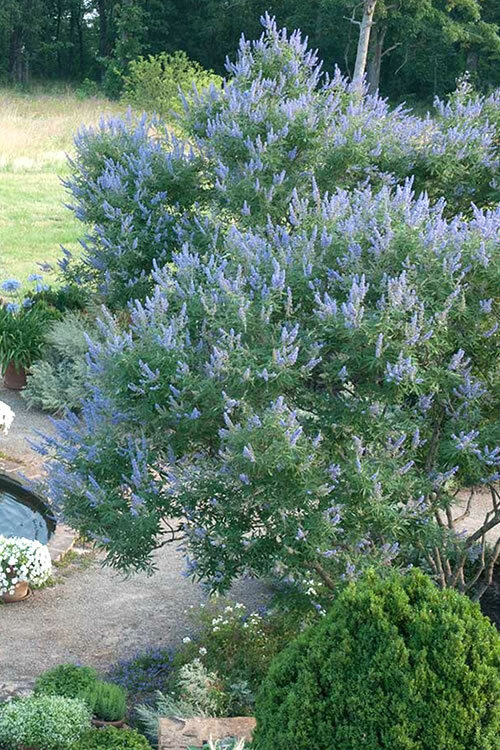 The Blue Chaste Tree, Vitex agnus-castus, is listed as cold hardy to USDA Plant Hardiness Zone 5a. NYC is in USDA Zone 5. When growing in a planter, the roots of a plant or tree are exposed to the colder air temperatures, so not sure if this tree would be cold hardy on your terrace. That said, as with butterfly bushes, the roots might survive okay and new shoots regrow from the base every spring. This happens to a lot of otherwise cold hardy plants when we have a colder-than-normal winter here in Georgia. If you could insulate the plant and container by wrapping it in a heavy blanket on the coldest days, when temps drop below 10 degrees F, this would help. Let us know if you need more details or have any other questions. 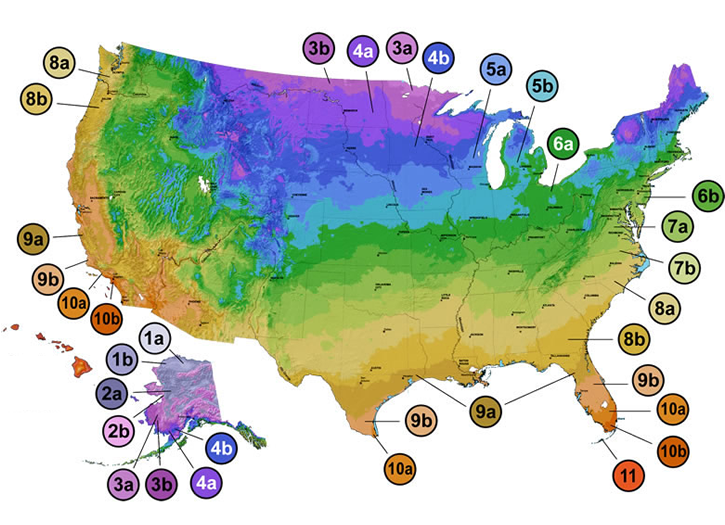 There in NYC you're in USDA Plant Hardiness Zone 5. Most fig trees are not cold hardy in that zone. That said, there's one fig variety we carry, the 'Chicago Cold Hardy' Fig, which has been successfully grown as far north as Chicago, which is also in Zone 5. This variety might make it there in NYC, especially if you could provide some protective insulation during the coldest periods in winter. To get all the details about this variety type Chicago Cold Hardy in our site search at the top of this page. Regarding cold hardy bamboo varieties that are listed as hardy in Zone 5, Snow Bamboo would be the most cold hardy (USDA Zone 4). Bisset Bamboo, Incense Bamboo, Macon Rivercane Bamboo, Red Margin Bamboo, and Yellow Groove Bamboo are among the other most cold hardy that we offer, all listed as hardy in USDA Zone 5. Let us know if you need more details or have any other questions. Q: How large would the 3 gallon Blue Chaste grow during the first summer? How many years will it take to grow to full maturity? Will it flower the first year? The Blue Chaste Tree is very fast growing when young...during the first 5 years or so. For example, a Blue Chaste Tree we planted 5 years ago beside our offices at the Nursery grew from about 3 feet tall to 15 feet tall and wide presently, which is almost 3 feet in height and width added per year. The trunk diameter went from maybe 1 inch or so to about 6 inches now. It's a really nice specimen. After 5 or so years the growth rate slows. My brother has one in his landscape that's about 20 feet tall and wide after 15 years. Chaste trees also flower at a young age. You should see a good number of flowers on a 3-gallon size plant during summer with flower counts increasing exponentially year after year. Q: In the 3 gallon pot, approx. how tall will the tree be when shipped and approx. diameter of the trunk? 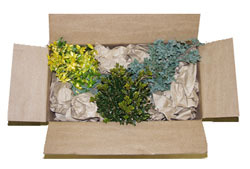 We ship nursery and garden center grade plants. Below are the approximate heights of this plant or tree when shipped. Sizes do not include the height of the container. 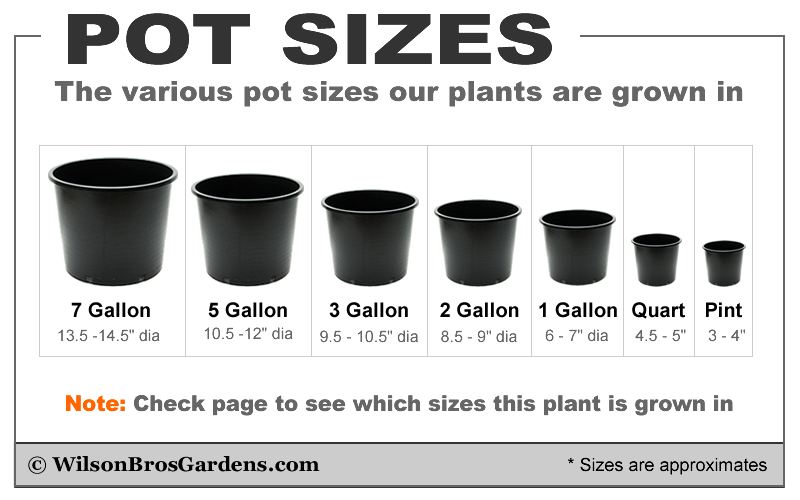 Note: On a periodic basis we prune our plants to maintain fullness, which means you might receive a plant that is shorter than the heights listed below. Note: Container sizes listed below may or may not be available. Available sizes are shown next main photo. Q: We are in Oklahoma-zone 7. Could a chaste tree be planted now or should we wait until fall? Vitex are extremely tough trees. Here in USDA Zone 8a we plant them year round. The chaste tree is hardy to USDA Cold Hardiness Zone 5 so I think you could do the same there in Oklahoma zone 7. Of course, spring and summer planting allows the tree time to start establishing a root system before the first winter, so you might want to consider that. Check out and follow the helpful tips we provide under the Planting and Care tabs on this page and you should be fine planting this one any time of year. Let us know if you need more details or have any other questions. We're at your service! Q: Will Vitex grow in Lexington, KY? 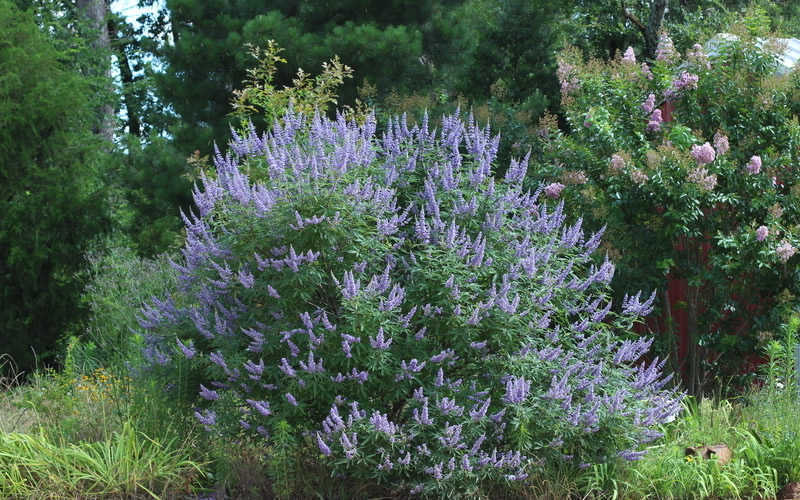 A: Hey Carl - The Chaste Tree, Vitex agnus-castus, is listed as cold hardy to USDA Zone 5a. 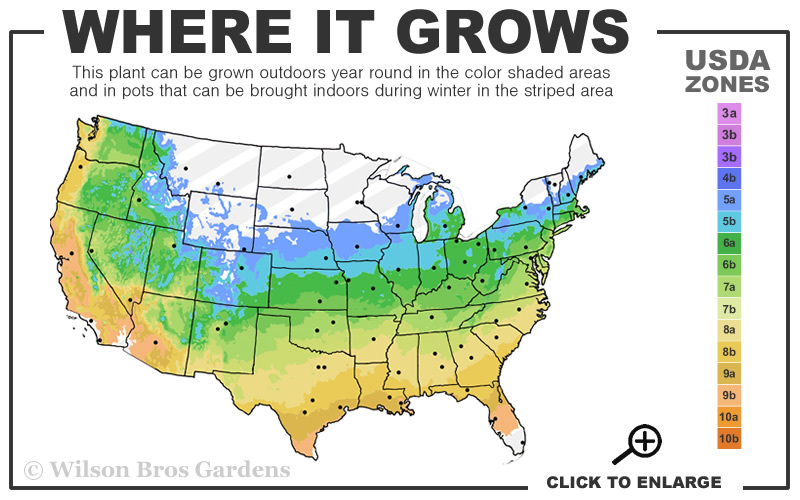 Lexington Kentucky is south of this zone in 6a so there shouldn't be a problem with cold hardiness for you. Let us know if you need more details or have any other questions. We're at your service!